Keeping score? We are – here’s the latest on several preservation issues around the region. 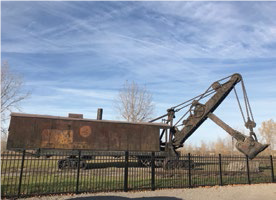 One of our region’s most unusual National Register listings, the Marion Steam Shovel is located in and owned by the Town of LeRoy. It is a significant and rare surviving example of the technology that evolved in the nineteenth and early twentieth centuries to provide large, inexpensive supplies of crushed stone for the vast American railroad network and, later, for the construction of roads. A condition assessment was recently completed on this 105-ton historic resource and will hopefully pave the way for increased attention and visibility. 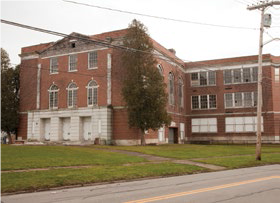 Included in our inaugural 2013 Five to Revive list, the decades-vacant former Holley High School in the village of Holley is finally on a path to a better future. This past spring, Rochester-based Home Leasing announced it had received crucial state funding to transform the building into affordable senior housing. This $17 million adaptive reuse project, which will also utilize state and federal historic tax credits, will result in 41 senior homes. The former auditorium will serve as meeting space and will also house the Village offices. Built in 1892, Epworth Hall is located on the grounds of Silver Lake Institute, a small, summer resort community on the banks of Silver Lake in the Town of Castile. 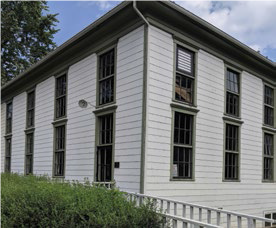 After struggling to address a prematurely deteriorated roof that threatened the building’s viability, the Institute was able to secure a $100,000 grant from NY State Senator Patrick Gallivan this year. This critical funding will go a long way towards maintaining this unique, National Register-listed structure. This entry was posted in Projects by Amanda Delle Donne. Bookmark the permalink. The Landmark Society of Western New York is supported, in part, by the New York State Council on the Arts with the support of Governor Andrew Cuomo and the New York State Legislature. Access the Admin Dashboard here.